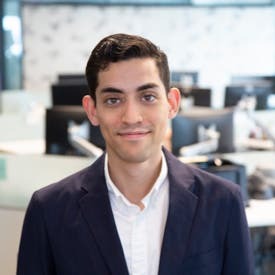 Adrian D. Garcia joined Bankrate as a data reporter in 2018. Adrian previously spent four years covering business, trends and other news stories for Denverite.com, the Fort Collins Coloradoan and other news organizations in Colorado. He graduated with a journalism degree from the University of Colorado Boulder in 2014. He participated in ProPublica's inaugural summer data institute in 2016 and the SABEW Goldschmidt Data Immersion Training in 2019. Marcus Goldman founded a financial firm in 1869, and a decade later the firm was renamed Goldman, Sachs & Co., after Goldman joined forces with his son-in-law, Samuel Sachs and his son, Henry Goldman. Over time, their company came to be one of the premier investment banks in the United States. Goldman Sachs became a bank holding company during the financial crisis. Years later through the acquisition of GE Capital Bank’s online deposits in 2016, Goldman Sachs launched GS Bank, an online-only institution. In late 2017, GS Bank became known as Marcus by Goldman Sachs, a brand already being used by the firm’s personal loan platform. In addition to loans, Marcus by Goldman Sachs offers certificates of deposit (CDs) and an online savings account. Accounts at Marcus by Goldman Sachs are designed for consumers who want to earn a higher yield than what their current bank or credit union is providing. If you need a new checking account, you frequently visit ATMs or mobile is your preferred banking channel, see what other financial institutions have to offer. Savers looking for a new CD or savings account enjoy access to competitive interest rates. Minimum deposit and balance requirements for CDs and savings accounts are relatively low. The bank charges very few fees. No access to branches or in-network, fee-free ATMs. Few products are offered by the bank, and there is no checking account. Customers have access to few features, and the bank does not offer a mobile app, mobile check deposit, checks or ATM cards. Marcus by Goldman Sachs offers a competitive APY with only a $1 minimum to start earning that APY on its high-yield Online Savings Account. Marcus by Goldman Sachs has been consistent about keeping its APY competitive in its savings account. Marcus by Goldman Sachs consistently offers a competitive yield on its savings account. It only requires $1 to earn a competitive APY that is more than 20 times the national average. This is one of the most competitive combinations of high APY and low minimum balance requirement around. This is in the ballpark of some of the highest APY savings accounts offered. While these APYs are competitive, there are still higher APYs out there in Bankrate’s top tier. If applicable to you, there are maximum limits of $1 million on the savings account at this bank. There is neither a debit card nor an ATM card offered for Marcus savings accounts. Marcus by Goldman Sachs offers standard CDs across various terms and a few no-penalty CDs. The minimum deposit is just $500. For all CDs, interest can be withdrawn without penalty at any point during the CD term. Early withdrawal penalties apply for withdrawing part of the principal balance. If rates change within 10 days of opening the account, you’ll earn the best available yield tied to your CD term. CDs are available without early withdrawal penalties. Low minimum deposit to open a CD. Yields are competitive, but some online banks pay more interest. No-penalty CDs pay lower yields than the standard CDs. Your experience with the bank will take place exclusively online. Don’t expect a mobile app, however — there isn’t one. But since you’re signing up for savings accounts, you may not care so much about that omission as you might with a checking account. You can also call customer support seven days a week. Savings specialists are available on weekdays from 8 a.m. EST until 10 p.m. (EST) and on weekends from 9 a.m. EST until 7 p.m. (EST). You can also chat with savings specialists once you log in to Marcus.com during those same hours. In 2018, Goldman Sachs bought Clarity Money, a fintech company that lets users track their finances across all of their accounts. You can open Marcus by Goldman Sachs savings accounts from the Clarity Money app.